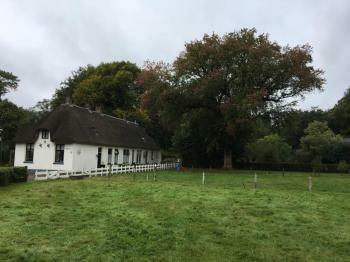 Koloniën van Weldadigheid (agricultural pauper colony) is part of the Tentative list of Netherlands in order to qualify for inclusion in the World Heritage List. If you’re looking for perfect photo opportunities, this is not the sites for you. It is just a countryside. But the value of this nomination lays in its history. I have visited 3 (Frederiksoord, Wilhelminaoord, Willemsoord) of 7 components, all not very far from Steenwijk, the town that can be reached from Amsterdam by train. I think the best way is to start in Frederiksoord (take the bus 19 from the Steenwijk train station) where a small museum is open. The museum itself is a bit disappointing, ‘cos they have only one small building with some expositions, mostly with pictures, but at least you can hear and watch an audio-visual presentation about Johannes van den Bosch and the beginning of the colonies. Another bad thing is that they do sell only Dutch publications and nothing in English. After visiting the museum I made a tour of the first colony – Frederiksoord; it is where everything started. Among others you can see here Westerbeek house, the headquarters of the Society of Benevolence from 1818 till now. (The building itself is older the Society, it was constructed in XVII century for Jean François van Westerbeek, the commander of the fortress in Steenwijk, and then it passed to the van Royen family (silk traders) before being sold to van Bosch.) The other interesting buildings are two schools: forestry and horticultural, Frederiksoord hotel (which was built before the Society’s guests started coming to visit the area) and de Bakkerij (now B&B); hotel and B&B are the only building you can enter, although nothing from the beginning of the colony remains. But in Frederiksoor the are still some oldest farmhouses, housing for officials, a canal and the road system. The most important attributes of Wilhelminaoord are the school for children from the colony (picture), the church with a priest house, a cemetery and a house for the old people. This colony is located just north of Frederiksoord and the road linking both is also included into the core zone. The third colony I visited is Willemsoord, 7 km from Wilhelminaoord, so you can hike or ride a bike. This one is the smallest of the three and the remains to see are less interesting: just some ditches, a farm and a Jewish cemetery. All three colonies were so called free ones and it means that I have to come back to see at list one of the unfree in the future.